Bring a touch of luster to your ensemble with these stained glass earrings. 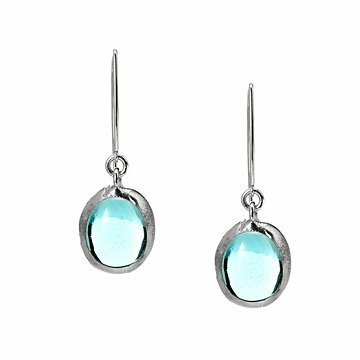 These stained glass earrings catch the light to bring a touch of luster to your ensemble. Each blue bead is copper foiled and then soldered by hand, lending an organic shape to the shimmering pendants. Handmade by Kathleen Plate in Georgia. total length 1.5" L; french earwires drop approx 1"
I absolutely love these earrings. Love the color, Love the length. These earrings are pretty, but not quite what I expected. For starters, they are a much brighter blue in person than the pale shade shown here. That's the biggest difference. I wish they were more of the lighter version; this blue is pretty - A sky blue or robin's egg blue - but I wanted that barely there hue. The posts are a bit thicker; I agree with the other posters who mention that, but I don't find them to be uncomfortable. They feel heavy until you get used to them. Lastly, I agree that the stones jiggle around some in the setting, but I don't feel like they are in danger of falling out. She said that they were beautiful. As previously mentioned the wire is a bit thick on this making it uncomfortable to wear. Also the craftsmanship is a little sloppy. Front looks great, but the back soldering is noticeably messy. The color of the stone is beautiful against the silver metal, and the length is nice, so I will try to get use to the wire. Look beautiful but too large, uncomfortable to wear. A smaller version would be nice. The posts were a larger guage than I'm used to, so a bit uncomfortable at first. They look beautiful, though. Recepient is a career girl in her 20s who LOVE them! The pictures doesn't do the earrings justice! I am so very pleased and can't wait for my daughter's reaction. The color is beautiful and the shape is lovely. I want a pair for myself! A perfect gift for a dear friend who's quite the earring fanatic! Beautiful. Looks just like the picture.